In planning my 5-day road trip through New England, I looked to Airbnb to see if I might find suitable accommodations in each of the cities I would be visiting. I had never used Airbnb before and thought this would be a great way to meet some local folks and save some money. Although each of my Airbnb hosts opted to provide me a room “on the house” in exchange for a mention in my blog, the costs were considerably less than a hotel room in each of the cities I was visiting. I stumbled upon this listing in Somerville which read “The Best Boston Experience”. I liked the fact that it was located in Somerville since I had planned to visit the Taza Chocolate Factory located in Somerville while I was there. But what really caught my eye was that the hosts appeared to be real foodies and had a lovely open kitchen that just beckoned people to gather and share a wonderful meal and conversation in. I contacted Peter, the host, to request a reservation for my first night in Boston. Peter was extremely accommodating and also took it upon himself to make a dinner reservation for me at his favorite restaurant in the North End. Upon my arrival, I was greeted by Peter’s wife, Christy who insisted on taking my bags from my Mini Clubman up the front stoop and then straight up a flight of stairs that brought us to the main level of this beautiful tri-level home. My room was on this floor, as was the guest bath, sitting area and kitchen. Peter and Christy lived on the two floors up above. Shortly after getting settled into my room, I announced to my hosts that I had to head into Boston to meet with my vendors in preparation for our walk through the next morning with my tour guides and our VIP client. Peter graciously offered to drop me into town and meet up with me afterward at L’Osteria, the restaurant in the North End where he had arranged for me dine. The moment we walked into L’Osteria, I felt like I was one of their regulars,- as if I had been coming there for years. Peter, who grew up in the North End, was a regular and had arranged for Patty (who he has known for 30 years) to take care of us that evening and so as soon as we stepped inside the intimate/cozy restaurant, I was greeted by Patty with a big hello, a hug and welcomed by name. Talk about making a great first impression! I followed Peter’s lead and allowed him to order for us. We enjoyed a lovely carafe of table wine along with some house specialties which included a chicken parmigiana and sausage and meatballs, aka to the locals as “d’s & b’s”. My first day and night in Boston couldn’t have gone better. I truly appreciated all those that made this trip possible. If you are planning a trip to the Boston area, I highly recommend you stay with Peter & Christy at their beautiful Airbnb for The Best Boston Experience! Interested in trying Airbnb? Click on this link to get $35 in travel credit. Next up…the road to Portland and a night out on this foodie town. As many of you know, I just got back from a 5-day road trip in New England where I traveled from Boston to Bar Harbor, stopping in Portland and other charming little towns along the way. I will provide a detailed description of my adventures in each, but first up is my visit to the Taza Chocolate Factory in Somerville (just outside of Boston). I didn’t know what to expect as I pulled up in my Mini Clubman (courtesy of Mini of Peabody) at the front entrance of the Taza Chocolate Factory. Images of Willy Wonka ran rampant in my mind. I was meeting with Amanda Mallen, Retail Manager for Taza Chocolate and the person who I had been conversing with via phone and emails for the past several months in preparation for our upcoming culinary tours taking place inside the Boston Public Market where Taza has an outlet shop. It was so nice to finally meet Amanda in person. Our tour began in the lobby/retail area where Amanda began to take me through the Bean to Bar process with several visuals. I learned about the flavor development of the cacao beans and how it is a one week process to ferment the beans and another week to dry on the farms in which they acquire their beans before being shipped to Taza’s factory in Somerville. Currently, Taza is receiving their beans from farms located in the Dominican Republic, Haiti, Belize & Bolivia. Taza Chocolate company was founded in 2005 & their very first chocolate bar was sold on Valentine’s Day 2007. Amanda shared with me that the first beans were actually brought over to the factory in a station wagon from the airport; fast forward 10 years later, they are now being delivered via ship containers! The beans are roasted at 230 degrees (farenheit) for about an hour-hour & a half which starts to loosen the shell. One batch of chocolate will yield 800 – 1300 lbs, depends on how dark the chocolate is. The next process after roasting is winnowing – that’s when they break the shells off and smash them down, to create the final product – cocoa nibs. The shells that remain after the winnowing process are then packed up and distributed to various organizations such as tea blenders and also used in local community gardens – to be used as organic fertilizer, the soil loves it, I am told. Stone mills from Mexico are used to grind the nibs. These stones are hand carved & have unique patterns on them depending on what the product they are being used for. Another common use of these ancient stones is for milling corn into flour for the making of tortillas. “Chocolate liquor” is the result of the finely ground nibs that have passed through the stone mills. The chocolate liquor is then pumped into the chocolate plumbing where they will then add sugar and the quantity depends on how dark the chocolate will be. The finished chocolate is popped out & packaged. Check out this video to see the bean to bar process for yourself. Taza chocolate can be found in 3k retailers nationwide. (Store locator on their website). Here in Boca Raton, FL, the discs can be found at Whole Foods Market which happens to be a sponsor of Savor Our City Culinary Tours. Taza’s website has great recipes and other useful info. They are open: Monday- Friday 11am – 6pm & Saturday – Sunday 10am – 6pm. Take a tour and learn how they make stone ground, organic chocolate and sample the results! Tours are available 7 days a week (although the factory is not in production on Saturdays & Sundays). As I mentioned in the beginning of this post, Taza Chocolate is one of the tasting stops on our new “Boston Markets & Cultural Tour” currently available to private groups of 10 – 14 guests. 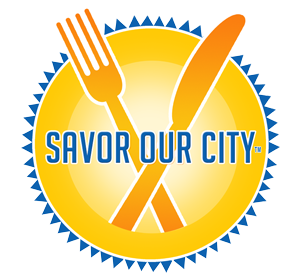 If you are interested in booking a private tour for your company or group of friends, contact us for a quote at info@SavorOurCity.com or (954) 410-3177. To continue reading on, click here for more about my adventures in Boston.